He's the premier historical artist in America - and now he focuses mainly on the American Civil War. When Mort Künstler began his current emphasis on Civil War art in the early 1980s, he had already accomplished more than a half-dozen artists could hope to accomplish in a collective lifetime. From portraits of prehistoric American life to the odyssey of the space shuttle, Mort Künstler had painted America's story - and was already renowned as "the premier historical artist in America." When he placed his focus on Civil War art, Mr. Künstler quickly established himself as the country's most-collected Civil War artist, and earned unprecedented acclaim within the genre of Civil War art. "Mort Künstler is the foremost Civil War artist of our time -- if not of all time," says Dr. James I. Robertson Jr., the dean of Civil War historians and the author of the celebrated biography, Stonewall Jackson. "To study his paintings," says Robertson, "is to simply see history alive." Pulitzer Prize-winning historian James McPherson concurs. "Of all the artists working in the Civil War field," he observes, "none captures the human element, the aura of leadership, the sense of being there and sharing in the drama, quite like Mort Künstler. He has that enviable talent of being able to re-create history on canvas and to translate events into art." Harold Holzer, Vice-President of Communications and leading authority on Civil War art with New York City's Metropolitan Museum of Art, believes the popular enthusiasm for Mr. Künstler's work is due to his artistic talent as much as to the authenticity of his art. "He deserves double credit" says Holzer, "His art is terrific and he's attracted thousands of people to Civil War art." Mort Künstler Men's Adventure - Male Magazine Cover July 1968 "Nine to Go"
Mr. Künstler's talent and training were nurtured from an early age. After studying art at Brooklyn College, U.C.L.A. and Pratt Institute, he became a successful illustrator in New York where he received assignments from book and magazine publishers. An important part of his training resulted from his affiliation with National Geographic Magazine. It was through their assignments of historical subject matter that he learned the value of working with historians so that accuracy was firmly imbued into his concept. In the early 1970s, Mr. Künstler's paintings began attracting the attention of serious art collectors. At first the interest was mainly in his Western subject matter, but after a major museum retrospective exhibition and a one-man show at the prestigious Hammer Galleries in New York City, he became known as an important painter of historic subjects. Since his first show in 1977, Mr. Künstler has had thirteen more highly successful one-man shows at Hammer Galleries, his most recent in December 2006. 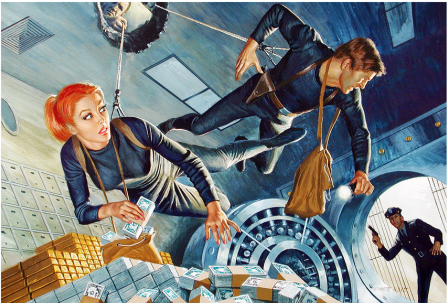 In 1982, a commission from CBS-TV to do a painting for the mini-series, The Blue and the Graydirected Mr. Künstler's interest towards the Civil War. Although the research was painstaking, he devoted much time to making sure that his painting The High Water Mark was meticulously correct. The painting was unveiled at the Gettysburg National Military Park Museum on July 2, 1988 in celebration of the 125th anniversary of the battle. Since then, Mr. Künstler has been concentrating on Civil War subject matter. Mort Künstler Men's Adventure - For Men Only Magazine Cover June 1968 "The Do - it Yourself Bank Robbers"
In 1986, more than two hundred Künstler artworks were published in the book, The American Spirit - The Paintings of Mort Künstler, with text by famed historian Henry Steele Commager. An updated edition of The American Spirit was published in 1994 by Rutledge Hill Press. Images of the Civil War - The Paintings of Mort Künstler, with text by Pulitzer Prize winning author James McPherson, was published in 1992. Gettysburg - The Paintings of Mort Künstler, also with text by James McPherson was published by Turner Publishing as a companion piece to the epic feature film and mini-series Gettysburg. In 1993, a one-hour television special, entitled Images of the Civil War - The Paintings of Mort Künstler, was shown on the A&E network. His reputation for both accuracy and artistic mastery earned Mr. Künstler a commission from the U.S. Postal Service in 1992 to do a painting of the Buffalo Soldiers. The stamp was issued in April of 1994. Other books featuring his art include Jackson and Lee: Legends in Gray, with text by James I. Robertson, Jr., Images of the Old West: The Paintings of Mort Künstler with Text by Michael Aubrecht, Dee Brown, Mort Künstler's Civil War: The North and Mort Künstler's Civil War: The South, Mort Künstler's Old West: Cowboys, and Mort Künstler's Old West: Indians - which were all published by Rutledge Hill Press. In 1998, the Nassau County Museum of Art in New York sponsored a one-man exhibition entitled The Civil War - The Paintings of Mort Künstler. More than 130 paintings, drawings, and sculptures were gathered together from around the nation. The seven-week exhibition attracted more than 30,000 visitors, surpassing the previous attendance record set by a Picasso exhibit. In Virginia, Governor James Gilmore officially declared a "Mort Künstler Day" in 1999, and in 2000, Governor Gilmore officially opened an exhibition at the Museum of the Confederacy in Richmond called The Confederate Spirit: The Paintings of Mort Künstler, which was the first one-man exhibition of a contemporary artist ever held at the museum. Later that year, a book by the same name was published by Rutledge Hill Press with a narrative by James I. Robertson, Jr. In a similar ceremony north of the Mason-Dixon line in Ohio, Mr. Künstler was selected as the Official Artist of the Ohio State Bicentennial, and his painting of General John Hunt Morgan's raid through Ohio was featured in a long-term exhibit at the Cincinnati Museum Center. Mort Künstler "An Apple for Traveller"
Mr. Künstler continues to participate in a variety of charitable causes that are close to his heart. In 2001, following America's 9-11 tragedy, he contributed one of his most popular limited edition prints -"Old Glory" - for a fund-raiser by the American Red Cross. The non-profit program raised more than $150,000 for the Red Cross to use on behalf of the victims of the 9-11 attack. He continues to provide art and assistance to Timber Ridge School - a residency academy for special students in Winchester, Virginia. In 2003, a residence hall at the school was named Mort Künstler Hall in his honor. 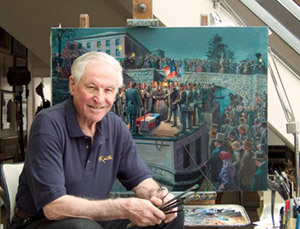 In 2001, Mr. Künstler was named the official artist for the motion picture Gods and Generals, and in 2002 Greenwich Workshop Press published his newest book: Gods and Generals: The Paintings of Mort Künstler. He also served as a consultant for the heralded Ron Maxwell motion picture, Gods and Generals, and his art publisher, American Spirit Publishing, released a series of historical Civil War limited edition prints of key historical events on which the motion picture was based. In 2002, Mr. Künstler became the first artist to be honored by a 6- month one-man exhibition at the new National Civil War Museum in Harrisburg, Pennsylvania. In 2003, he received the Jefferson Davis Southern Heritage Award from the Military Order of the Stars and Bars - composed of descendants of the Southern officer corps - which followed his 2001 receipt of the Henry Timrod Southern Culture Award by the M.O.S.B. Mr. Künstler has also been named as an Official Artist for the H.L. Hunley, and unveiled a new painting of the H.L. Hunley during ceremonies in Charleston, South Carolina on April 17-18, 2004. He has also been commissioned to design and furnish all the artwork for the Middletown, Ohio Veterans Memorial, which was unveiled on July 4, 2004. Probably no other artist in our nation's history has recorded so many events in American history and certainly no one has painted them with the extraordinary authenticity and drama as Mort Künstler. Mort Künstler is America's artist.